I’m talking to you Margot Robbie- and a host of Hollywood A-Z listers when I say,”Enough is Enough.” Your blatantly obvious theft of the soon-to-be-patented #StanburyBob is shameful, and your highly paid stylists know better. After Barbie met her Ken (Caroline and financier hubby Cem Habib) the couple had daughter Yasmine and twins boys Zack and Aaron. Caroline also had another baby in 2008, her exclusive gift shopping service “The Gift Library.” Like many career women that are also mothers, Caroline wanted to re-invent her look…. thus #TheStanburyBob was born! 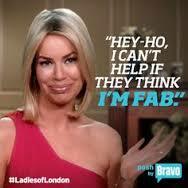 After “Ladies Of London” aired in 2014 Caroline Stanbury became a media darling in the US. Many Hollywood starlets were not amused that a Brit on American television should be sporting completely perfect hair. A secret plot was hatched to steal #TheStanburyBob ‘s thunder by several prominent actresses that this blogger is calling out publicly for the first time. The Hollywood Reporter and Deadline will be running this as front-page news Monday when “Ladies Of London” season 2 premieres. If any of the alleged bob thieves choose to make a statement, BitchByBravo will post their rebuttals. Below is the newly obtained shocking photo evidence of #TheStanburyBob being worn by unauthorized heads. Jennifer Aniston– Seriously Jen? You had the “Rachel” and claimed to hate the attention your hairstyle received? Sounds like you’ve changed your tune. Go back to your long stick-straight hair or beach-waves, which both suit you. Trust me, #TheStanburyBob is doing you no favors…It only looks smashing on Caroline. Katy Perry – Ugh…..moving on. Gwyneth Paltrow – Not surprising….she went after Martha Stewart Living with “Goop” so of course would have no qualms about bob theft. 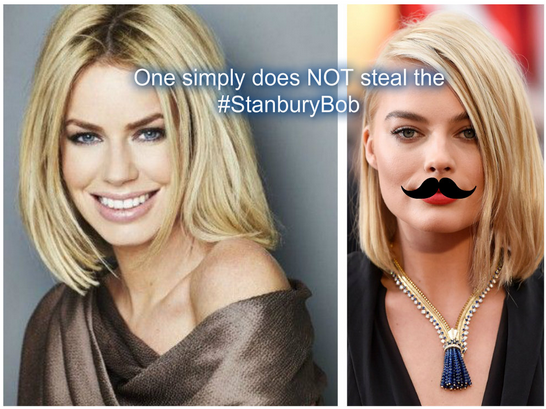 Margot Robbie – She and her team of stylists tried to steal #TheStanburyBob for the 2015 Oscar telecast. Luckily Robbie was caught red-handed, and exposed recently on Twitter. She has since flown home to Australia and dyed her hair red. God is good and just. 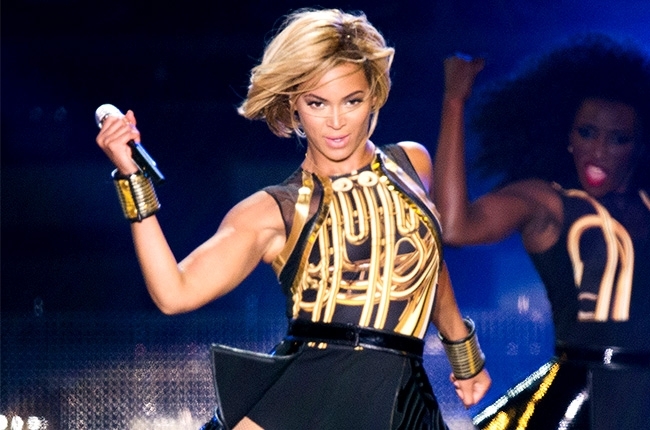 Beyonce – Yeah I’d let this one slide too. Not sure what to do…its Beyonce!